Play is essential for all children but especially for kids with autism and other special needs. Many children with special needs spend upwards of 40 hours a week in therapy and school, and need a break from all that work. Summertime play also gives kids an opportunity to feel more normal. Outside play is particularly helpful for children with autism. Children get to do things outdoors than they could not do indoors, such as running and jumping, and this type of outdoor exercise can improve muscle strength, coordination, and flexibility. Playing outside can improve cardiovascular health and exercise endurance in ways that increase a child’s life expectancy. Regular outdoor play can improve body awareness, balance, and motor skills. Many kids with special needs have vitamin D deficiencies; exposure to the sun during outdoor activities helps kids get the vitamin D they need for good health. Outdoor play also provides mental benefits. In particular, exercising outdoors helps boost the self-esteem of kids with special needs by helping them improve their physical skills and overcome obstacles. Playing outside with other kids can also provide social benefits that may include improved behavior and relationship building. While play provides extra benefits, many special needs kids face particular challenges when it comes to play. They may tire quicker than do other students, and some children have mobility issues. Communication challenges, difficulties with social skills, and sensory issues can interfere with play. Fortunately, a number of creative minds and forward-thinking companies have created special needs toys that nearly any kid will love. The Egg & Spoon Race Game is a great way for kids to have fun on a summer day. The kids balance a plastic egg on a spoon as they run towards the finish line. Racers must be careful, though, as dropping the egg will cause it to crack. A Double Swung Package swing set allows parents and able-bodied kids to swing together, side by side. Time for a rest? Try the Hammock Chair Stand-Mediterraneo, a comfortable hammock chair. Brightly colored Sand & Water Toys makes every trip to the beach more fun. The beach can be a sensory therapy experience for kids with autism. 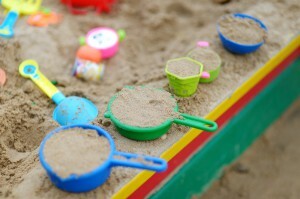 Sand tools, a watering can, a bucket, molds, toy boats and trucks can help kids explore the sand and sea. Deluxe Indoor Single Swing Package-Child is an indoor swing that offers the same fun as the outdoor versions. Houston gets warm in the summertime and kids with special needs may be more sensitive to the effects of extreme heat. Indoor versions of outdoor toys, such as indoor swings, keep kids entertained during hot summer afternoons. A Gorilla Gym creates an indoor gymnasium, providing kids with hours of fun on an indoor swing, rings, and ladders. The unit attaches to a doorframe like a home pull-up bar, without the need for drilling or hammering. Choosing the right summer toy can help a child enjoy indoor and outdoor fun in Houston. Although playing presents unique challenges to children with special needs, the physical, mental and social benefits make summer playtime worthwhile.